It was impossible to verify their authenticity, and none of them were written on letterhead. But the binders included some documents that made specific reference to the C.I.A., and their details seem consistent with what is known about the transfer of terrorism suspects abroad for interrogation and with other agency practices. And although the scope of prisoner transfers to Libya has not been made public, news media reports have sometimes mentioned it as one country that the United States used as part of its much criticized rendition program for terrorism suspects. While most of the renditions referred to in the documents appear to have been C.I.A. operations, at least one was claimed to have been carried out by MI-6. 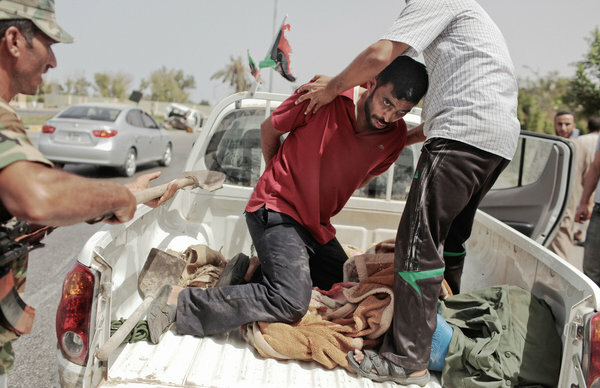 “The rendition program was all about handing over these significant figures related to Al Qaeda so they could torture them and get the information they wanted,” said Peter Bouckaert, emergencies director of Human Rights Watch, who studied the documents in the intelligence headquarters in downtown Tripoli. The speech that appears to have been drafted for Colonel Qaddafi was found in the C.I.A. folder and appears to have been sent just before Christmas in 2003. The one-page speech seems intended to depict the Libyan dictator in a positive light. It concluded, using the revolutionary name for the Libyan government: “At a time when the world is celebrating the birth of Jesus, and as a token of our contributions towards a world full of peace, security, stability and compassion, the Great Jamhariya presents its honest call for a W.M.D.-free zone in the Middle East,” referring to weapons of mass destruction. In an interview on Wednesday, Mr. Belhaj gave a detailed description of his incarceration that matched many of those in the documents. He also said that when he was held in Bangkok he was tortured by two people from the C.I.A. On one occasion, the Libyans tried to send their own plane to extradite a member of the Libyan Islamic Fighting Group, Abu Munthir, and his wife and children, who were being held in Hong Kong because of passport irregularities. The Libyan aircraft, however, was turned back, apparently because Hong Kong authorities were reluctant to let Libyan planes land. In a document labeled “Secret/ U.S. Only/ Except Libya,” the Libyans were advised to charter an aircraft from a third country. “If payment of a charter aircraft is an issue, our service would be willing to assist financially,” the document said. While questioning alleged terror group members plainly had value to Western intelligence, the cooperation went beyond that. In one case, for example, the Libyans asked operatives to trace a phone number for them, and a document that was in the MI-6 binder replied that it belonged to the Arab News Network in London. It is unclear why the Libyans sought who the phone number belonged to. Reprinted from The New York Times, International, of Sunday, September 4, 2011.